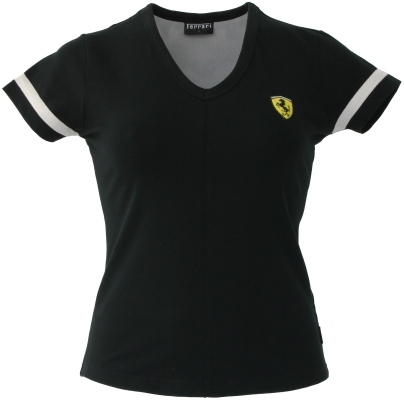 Ferrari Ladies V-Neck Top with Mesh Trim - Black. Seamed V-Neck skinny top with contra colour mesh effect fabric in back neck and on sleeve binding in Cotton / Elastane. Ferrari racing shield badge to left chest, Ferrari to back neck and Ferrari branded side seam label. Available in size 2 & 3 (L & XL).